Over the last couple of years I've been to a few Centurion Running events to support Mrs in her ultra running adventures. I've always been impressed at the slick organisation and friendly supportive atmosphere. For I while I've wanted to be on the other side of the fence and take on a 50-mile event myself. 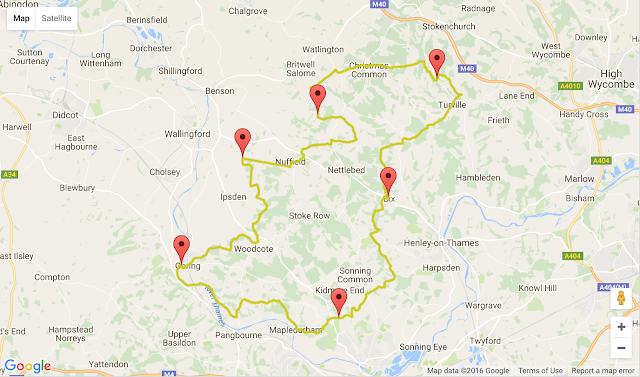 This is the inaugural Chiltern Wonderland 50, and is the third in the four-race series that make up the 2016 Grand Slam of 50s. The other races are the North Downs Way 50, South Downs Way 50, and Winter Wonderland 50. After spending a couple of days taking a look at the course I knew what was in store. Having run the full length of the North Downs Way recently, I was fairly well hill conditioned. The hills on the CW50 course aren't too severe - none are really big, and only one is exceptionally steep, and there were thankfully few steps - but there are a lot of hills, continual ups and downs and not so much on the flat. I was fairly confident I could get to the end, the unknown was in what condition I'd be when I got there! The cut-off was set at 13 hours, with cut-offs at each of the five intermediate aid stations. 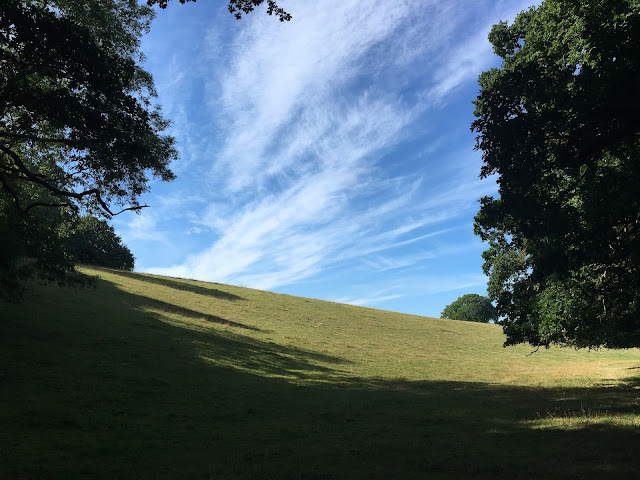 I was determined not to think about time though - it's an unhelpful distraction when the only aim in my first 50 miler is to get to the end within the cut-off. 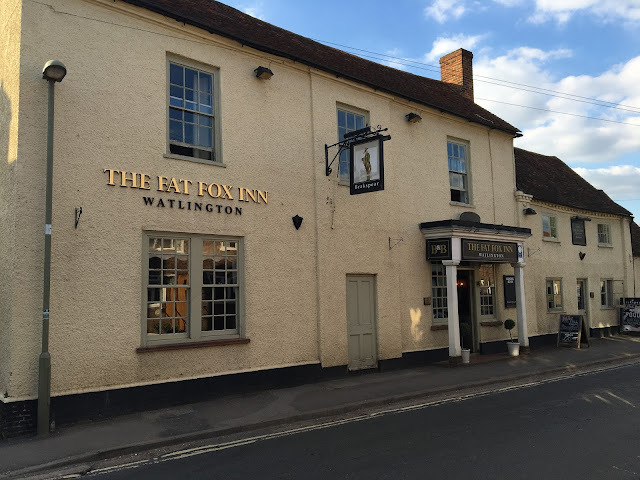 Mrs was running too, and we had decided to stay at The Fat Fox Inn in Watlington again. I stayed there half way round my recce run and was impressed with the quietness of the rooms and the excellence of the food. 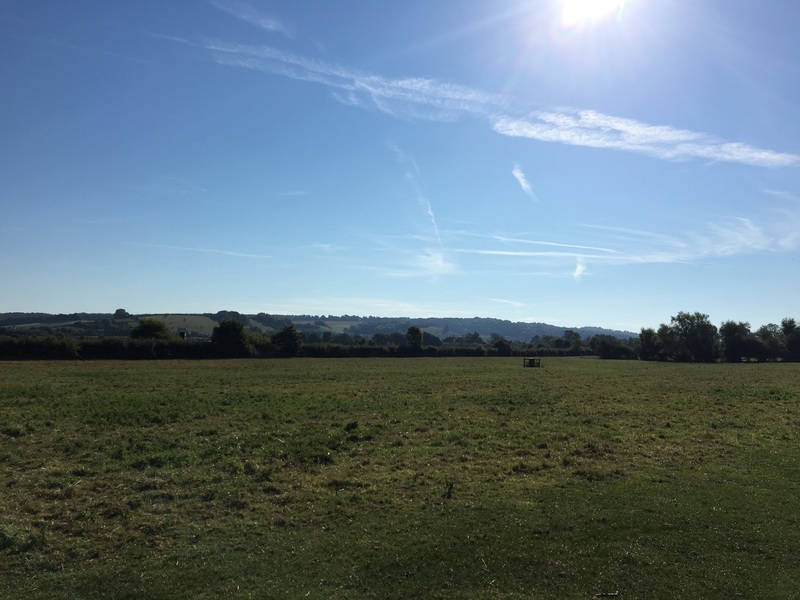 On Saturday morning we drove over bright and early to Race HQ in Goring in good time to get kit checked, and pick up our numbers. I was a bit stressed as I wasn't able to find any breakfast, but thankfully we had leftovers from the night before (though we did get a few odd looks for eating lumps of steak out of a foil package). 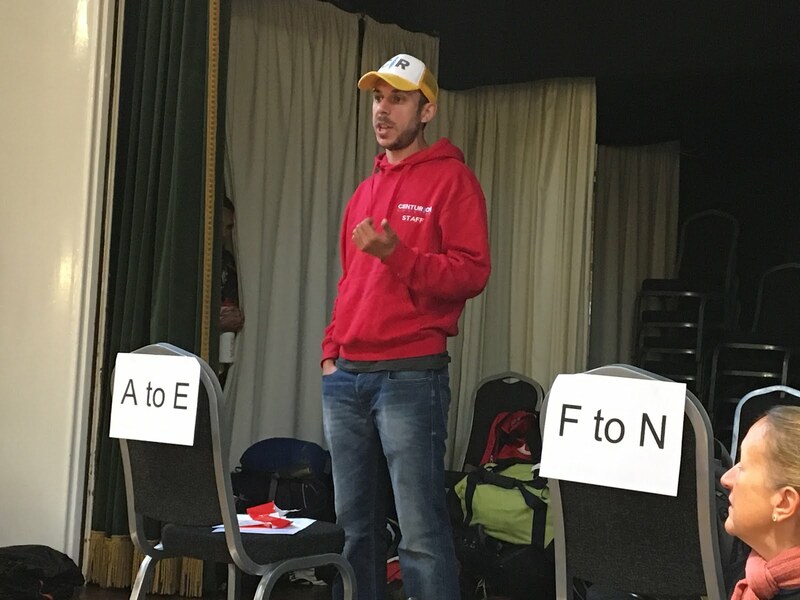 James Elson, Race Director, gave his usual light hearted (but no nonsense) race briefing. I was starting to feel nervous... Before I knew it we were walking the few metres down to the start on the Thames Path and at precisely 9am we were off! 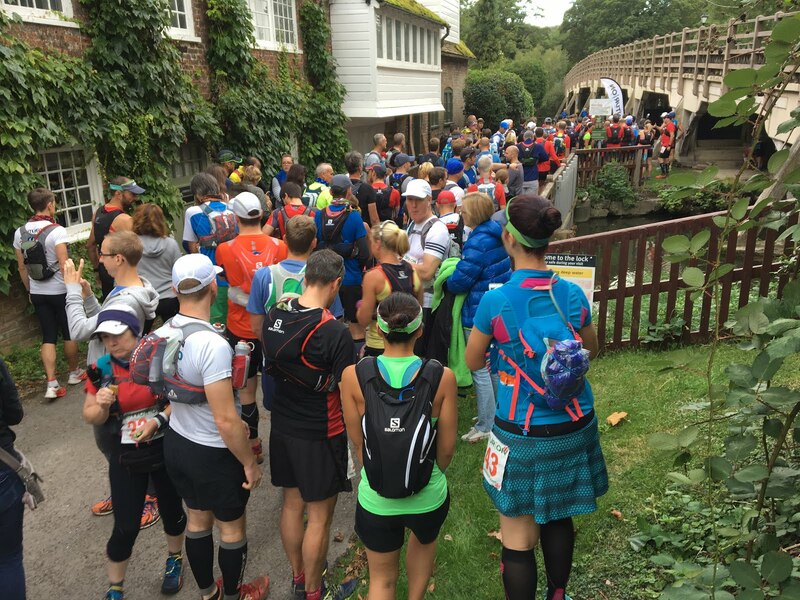 The first section down the Thames Path was fairly narrow, a bit of a squeeze for the 179 of us on the start line. I was keen to get off slowly and be sensible for the first few km while I settled into my stride, so I started about three quarters down the field. Mrs and I had discussed running together, but this being my first attempt I wasn't sure what to expect so I chose to run alone. If we met up further through the race then then fair enough. That being the case, we ran at around the same pace for the first half-dozen km anyway with the gap between us varying from just a few metres up to a hundred or so. My pace was good, and I felt good. After two hours the first aid station came up, this was the 16km point at Tokers Green. 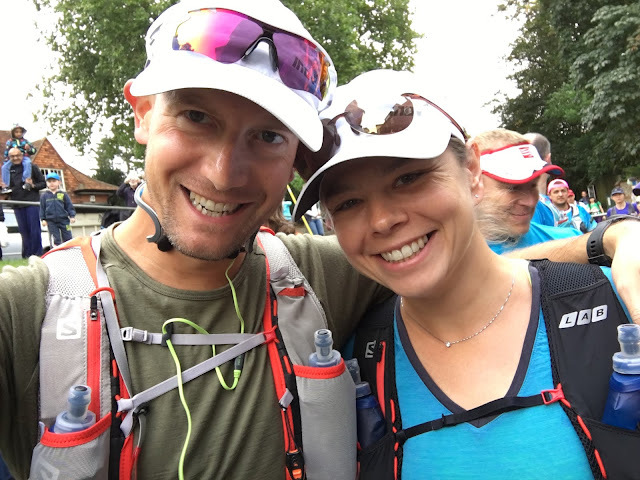 Mrs had found that hanging around at aid stations accounted for a whole hour and a half of her overall time in her first 50 back in 2013, so we were both determined to adopt a quick in-and-out strategy. This was what she adopted at the North Downs Way 100 recently, and to good effect. I barely stopped at the aid station, all the nibbles were things like cookies, chocolate, and jelly babies - I didn't want to start filling up on sugar this early, so I got my water bottle topped up and set off quickly. I was running well, bang on 8km/h average - keeping that pace up would see a finish in 10 hours, but I've learned not to think like that - I knew the middle of the course was where the bigger hills are, and I'd inevitably slow down in the closing sections as I grew tired and the light faded. The course had been heading generally Eastwards and now turned to the North, heading up to the next aid station, 28km in at Bix. Louise had been popping up regularly in her role as a marshal, checking people were handling road crossings sensibly and shouting encouragement. "You're not getting squished on my watch!" she called at one crossing. This was the first interim timing point, I arrived at 03:43:34 and in 143rd place and about an hour ahead of the cut-off time. The food at Bix was better for me; I took a few cocktail sausages, tiny sausage rolls, and a couple of cheese and ham sandwiches. I wanted to make sure I drank and ate well throughout the day - I'm nowhere near as well fat adapted as I have been in the past, so just trickling in the food was the plan (but still avoiding sugar). I set off from Bix quickly again, making a few places as some of those who I arrived in with sat down for a bit. I'd continued at an average of around 8km/h, but there was a harder bit coming up. To be honest, although I remember some of the views and terrain, it's hard to remember what order it all came in. There were some beautiful houses and gardens, incredible views over the Chiltern hills, and no end to the changes in surface - woodland areas, grass, the odd section of road, fields full of horses and cows - you name it, we ran on it. This makes the course interesting and helps give a sense of getting somewhere. There's nothing worse than trudging along in a straight line, the horizon never getting any nearer. I hadn't seen Mrs behind me for a few hours - but she's got an incredible diesel engine and never seems to slow down. I more than expected her to reel me in over the final third as my pace began to drop off. 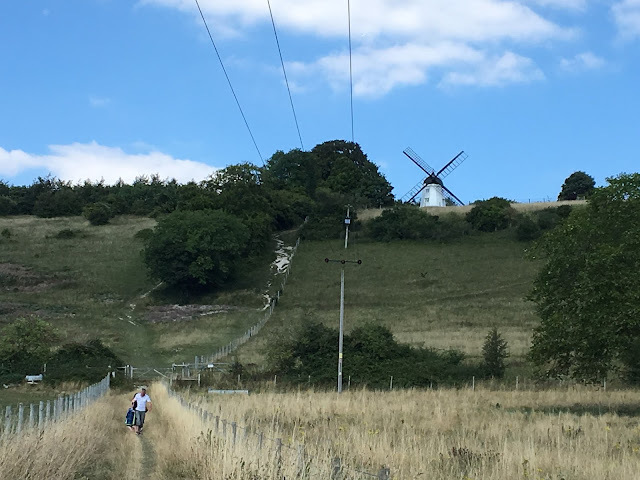 This next segment had some more serious climbs, including the steepest climb on the course coming out of Turville up to Cobstone Windmill. My pace slowed, but I was still running on the flat and downs, and hiking the ups. Checkpoint three at Ibstone School, Ibstone, was a welcome sight and at 41km represented almost exactly half way. My official time here was 05:16:53 and I had climbed a few places to 124th. I was encouraged, assuming I didn't have a tremendous collapse in the second half I should be in time to make it within the 13 hour cut-off. I was getting a few murmurs from my legs now - right ankle was feeling a bit fatigued, and my knees were complaining. I'd maintained a steady effort throughout, however, and was still running on the flats and downs. 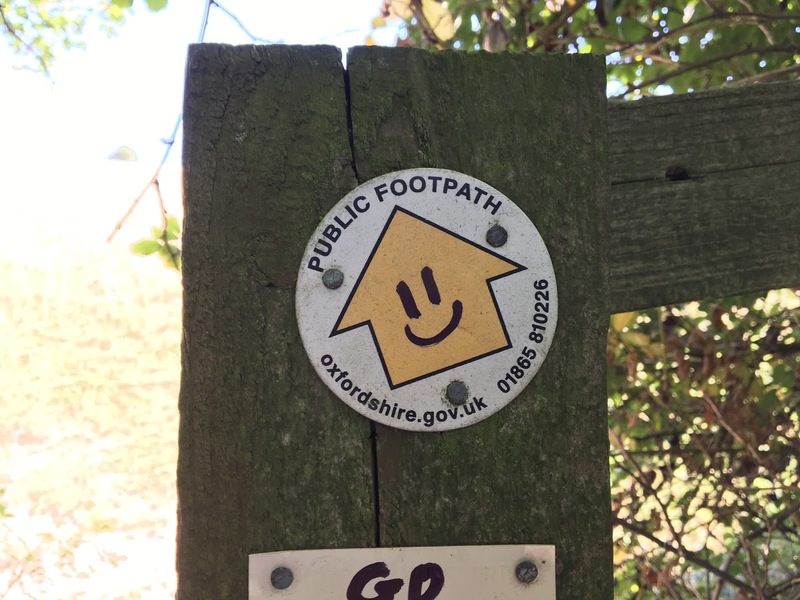 I got a good mental boost ahead of the next aid station as I realised I'd crossed over from the day one route to the day two route of my recent course recce. Downhill sections were getting more painful as my knees complained some more. Uneven surfaces were causing trouble now too as my right ankle continued to feel weaker. I told myself to keep running though, and I did. Swyncombe aid station at 53km came into view, and I was delighted to find cubes of cheese! I had been really hoping for some cheese! I took some more little sausage rolls and bits and pieces, and set off again - still not hanging around at all in the aid stations. I noted my watch ticking over to 56km, this is now officially the longest run I've ever done! 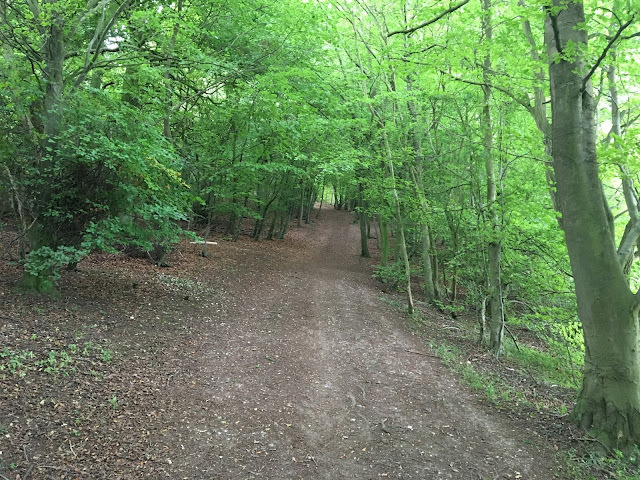 I remembered the next section fondly from the recce run, a series of long gradual descents through some lovely forest areas - I was looking forward to opening up my legs and just flowing down this segment, but it was not to be. Knees and ankle were keeping me to a steady jog at best. I was very happy to see the final aid station at the end of the long Grims Ditch section. I'd lost a couple of places in the previous few miles and was starting to suffer more. I stocked up well knowing it would be getting colder as the sun set. I stayed here for the longest time of any aid station, but it was still only a few minutes. I set off on the last leg with a time of 09:07:57 and still in 124th place. 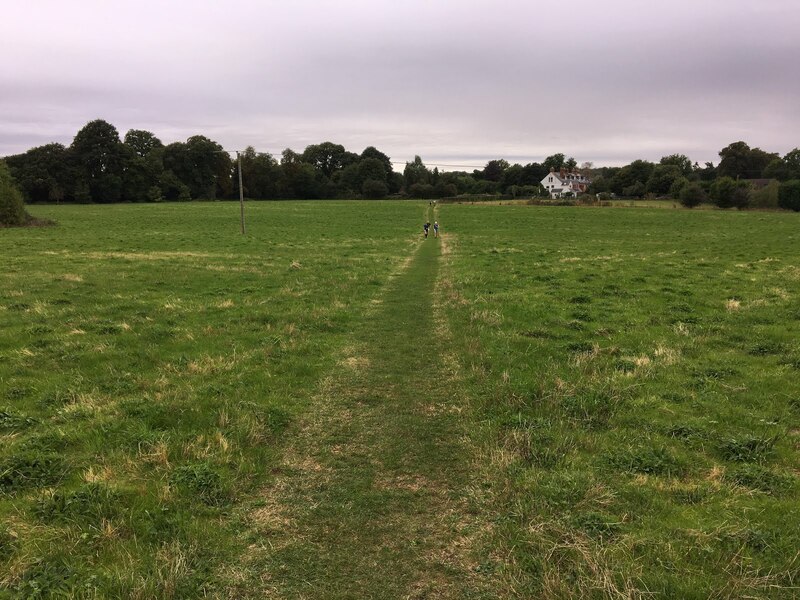 I was determined that any walking I did would be proper marching at pace, not strolling along, so as I slowed down I made sure not to fall into the trap of strolling along - you can lose hours that way. 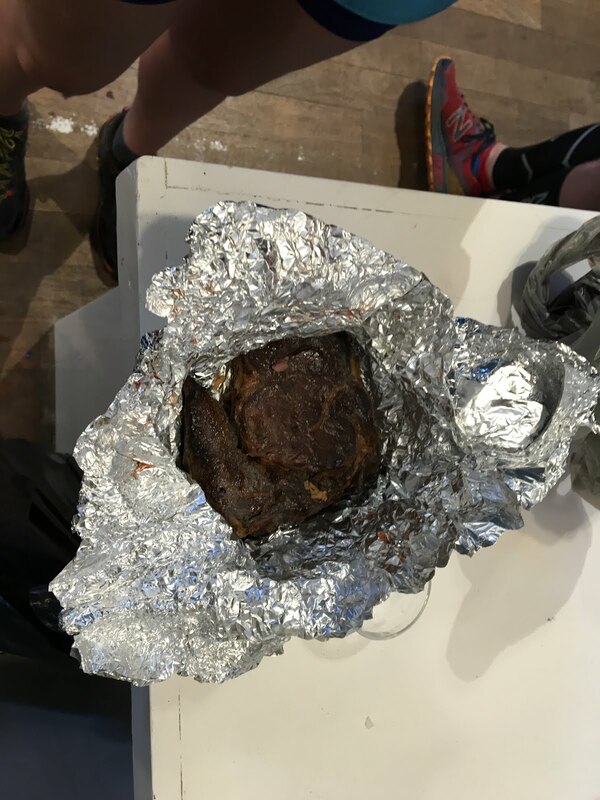 I regretted not getting my head torch out at the aid station or having it in an easy to reach location, and lost another place while I fished it out of my bag. The final 6 or 7km were now hiking as fast as I could - the light had faded completely and it was my first time with a head torch. The torch was great, but I didn't have the stability to cope with the variations in terrain now so running would be a bad idea - even if I could run! More head torch practice required - I'm looking forward to getting out on Wimbledon common in the dark now. It was a hard slog now coming back into Goring, an annoyingly circuitous route round to the back of the Village Hall, and then a fairly unceremonious finish in front of the timing desk - but, I did it! My first 50-mile race, finished in 11:38:31 and in 131st place. I can say already I'll be doing another one, and it'll be a Centurion event. I want to finish well, i.e. still running and not with bits falling off (ankle, knees). I didn't hurt myself with any seriousness, I'm writing this the following day and I'm a bit stiff and aching but nothing that won't recover over the next week. With some longer and more consistent training runs I'm sure I can build up more resilience. I've come a long way this year with endurance running, and I'm really enjoying it - more to come! 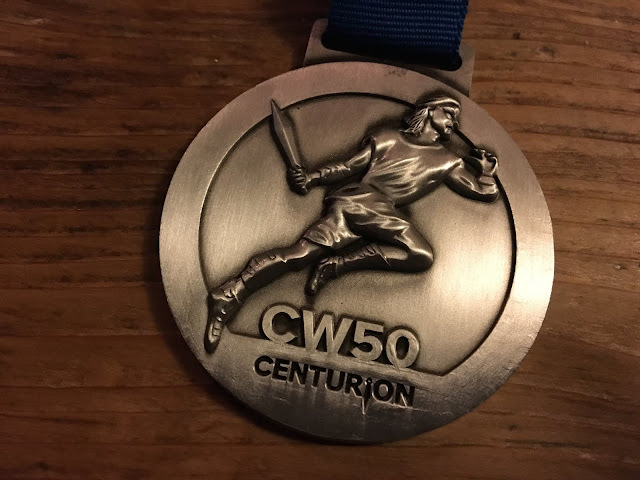 Thanks to the James and the Centurion crew, to the fantastic volunteers on all the aid stations, and to super-women Mrs and Louise, my ultra inspiration! 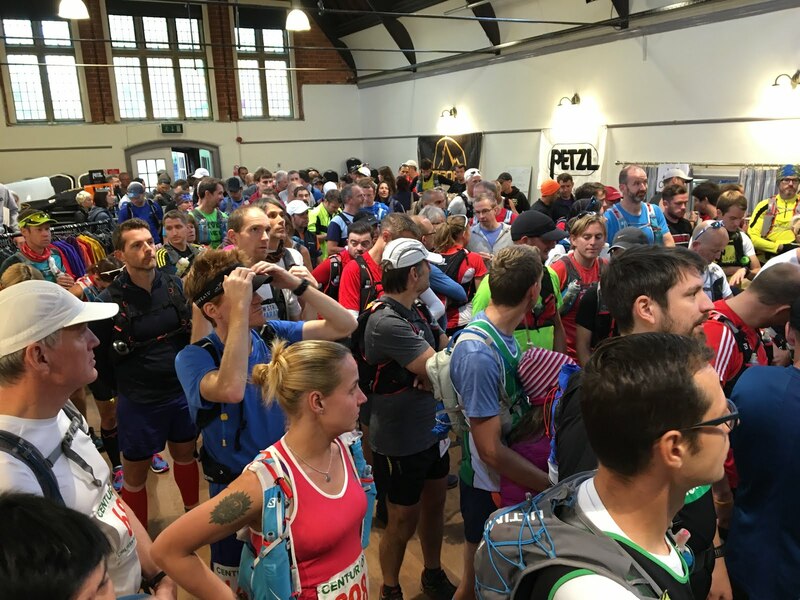 The Centurion Running Chiltern Wonderland 50 race day is getting near. Very near! 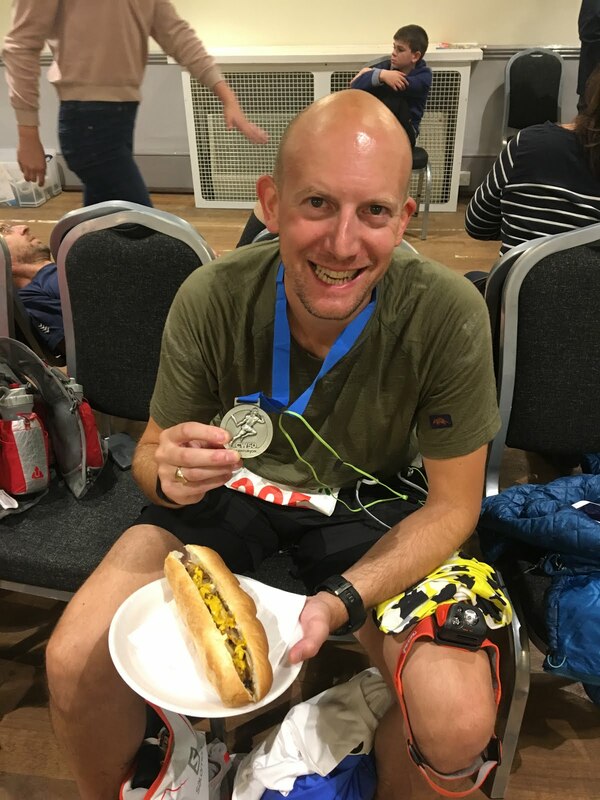 My first 50 mile event, and far further than I've run/walked/staggered in one go before. I wanted to spend a couple of days taking a look at the whole route so I knew what the terrain was like, if there were any surprises, and where there were chances to go wrong and get lost. 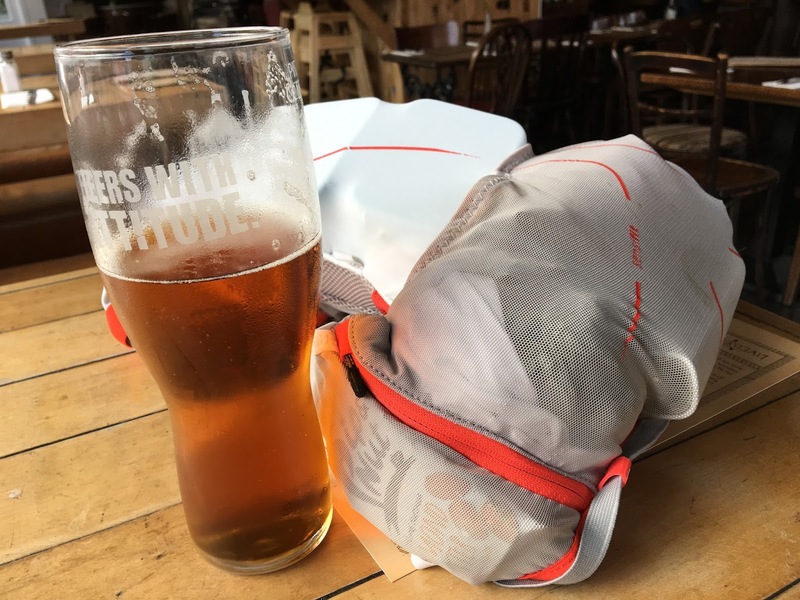 I took a copy of the route map and plotted it in my trusty OS Map Finder app, packed my Salomon run vest with a few essentials, and got myself to Wimbledon station in time for the 7am train to Goring-and-Streatley (via Clapham Junction and Reading). 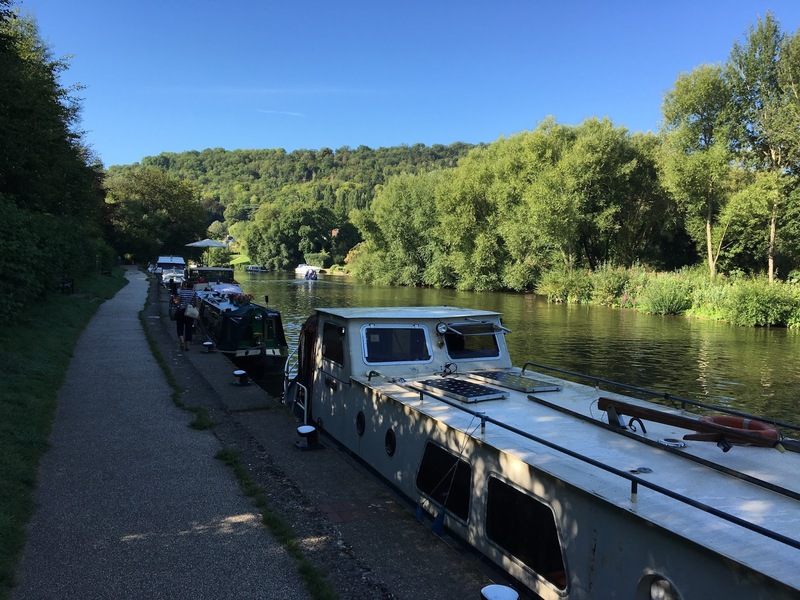 I started from Goring-and-Streatley station which is just a few hundred metres form the River Thames. 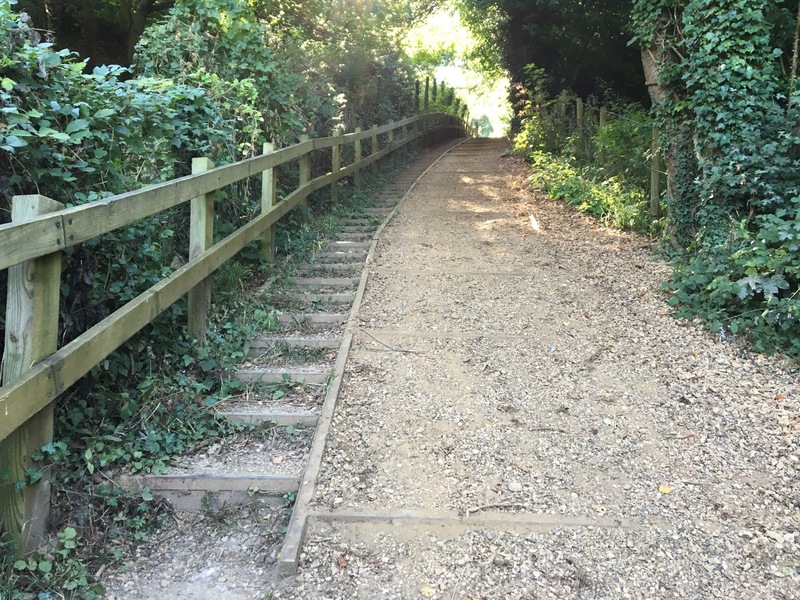 The first section down by the river is lovely - the beautiful clear skies and early-morning warmth of the sun on my back helped too. The first few kilometres stay down by the river, snaking back under the railway, before climbing a little up Whitchurch Hill, inland from Whitchurch-on-Thames. There's a good view from up here, the first of many. 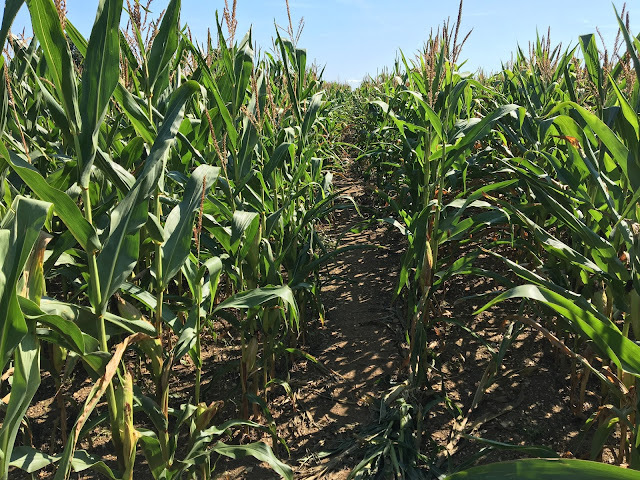 The beginning of the route is quite runnable, with a few short hikes, and should help get the field spread out fairly quickly. The start on the Thames Path is narrow for some distance, it will be important to be suitably positioned according to intended pace - not so much that you'd get "stuck at the back", more to avoid being swept along with the faster paced people and feeling you need to go at their pace to avoid holding them up. Generally, people always go off too fast, so this should be avoided. I'd prefer to start right at the back - it's a long day and keeping the pace in check at the start will pay off later on. As always, there's plenty of wildlife to look at - with some getting more involved than others. 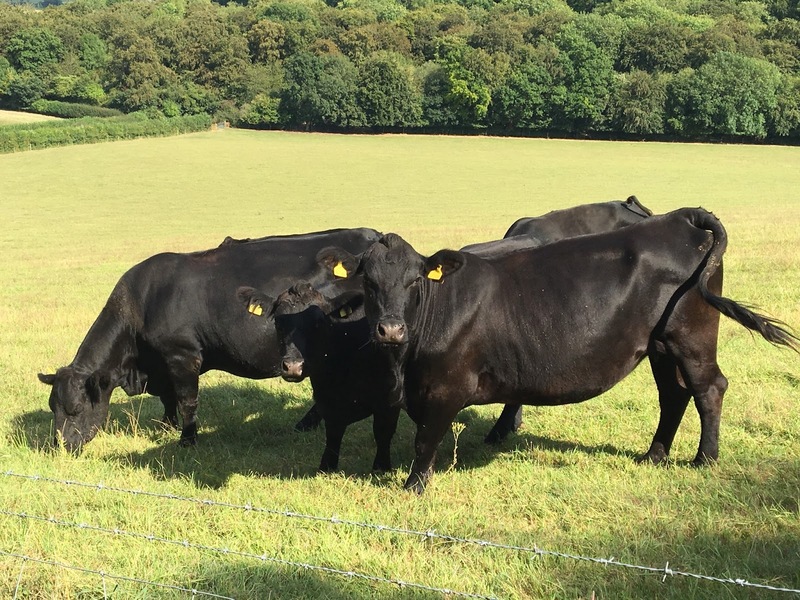 I'm more confident around cows than I used to be (they're so damn big!) 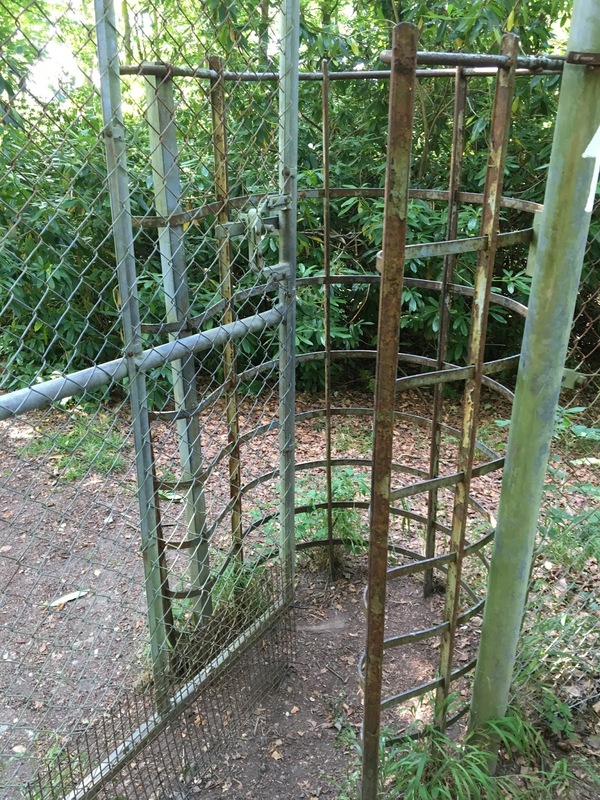 but this one just would not move from the gate. I had to climb over the railings instead. Unlike most other Centurion events, this route doesn't follow a national trail. 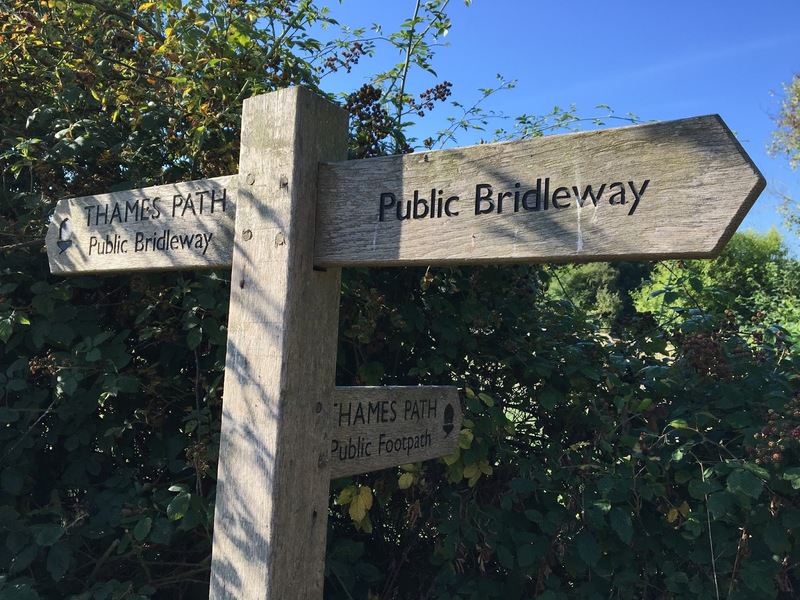 Instead it takes in sections of the Thames Path, the Chiltern Way, Ridgeway, The Chiltern Way Extension, and probably all sorts of other things. 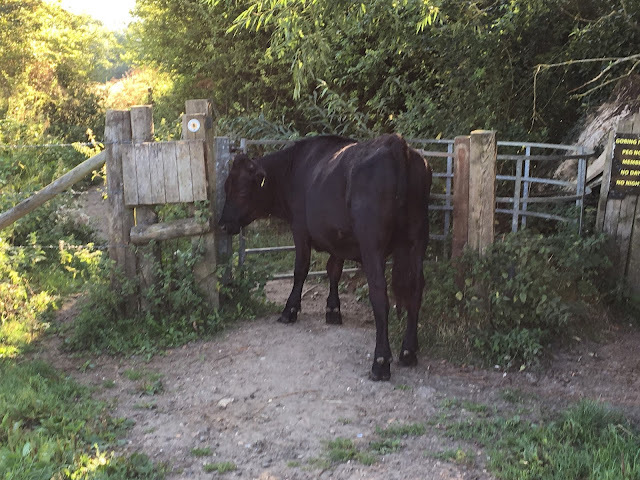 Having run the full length of the North Downs Way recently where as long as you follow the acorns you're good, this route is not like that. It will be important to keep your eyes peeled for the race day route markings as it does chop and change across pathways. Still early on, the first of a few sets of steps. 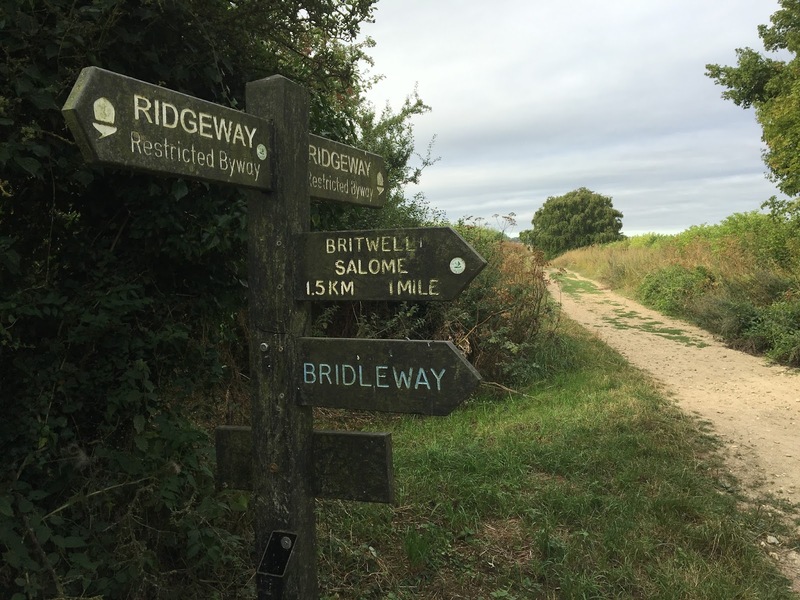 Thankfully most of this route is more gentle inclines rather than needing steps - an experienced runner should be able to run the vast majority of it. I'm not one of those though, so I walked up the steps. The going was good. Surface under foot was good, no puddles or heavy ruts, just well-packed routes on trail, grass, and occasionally concrete (but not much). Whilst such hard ground is good for stability, I did find during the day my feet started to ache as there are long stretches with larger stones ready to push into the bottom of your feet. If you run in very light thin soled shoes you need to be ready for it. The sun was out in full force now, but it didn't hit full-on heatwave levels so although I got hot, it wasn't too uncomfortable. One learning point is I don't tend to drink until I get thirsty - I resist the hype about continually drinking all the time, I prefer to listen to my body. However, I found I'd left it too late this time, having drunk only one of my 500ml bottle in about the first four hours. I got much thirstier after that and it slowed me down as I conserved my remaining water. With regular aid stations on race day, conservation of water shouldn't be an issue so I'll make a point of starting early and sipping regularly. 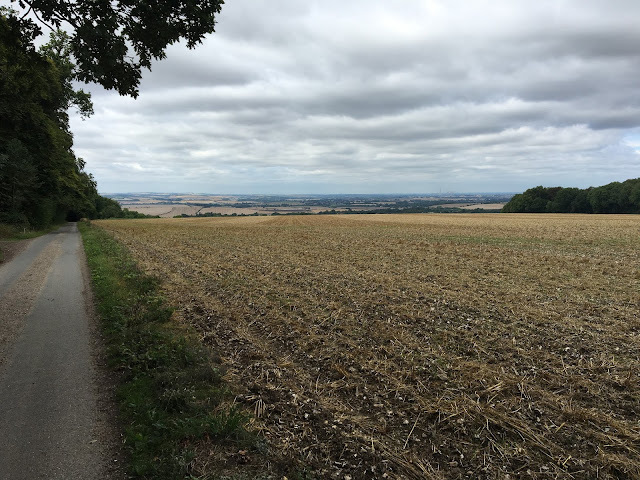 There was a lot less "running diagonally across fields" than on the North Downs Way - one notable exception was the cornfield above which had plants as tall as me! They whip at the arms but it's only a minute or two to traverse. I was wearing ankle-socks, shorts, and a t-shirt and apart from the corn field, and one or two fairly short stretches that were a bit more nettle and bramble laden there wasn't too much fighting with nature required. 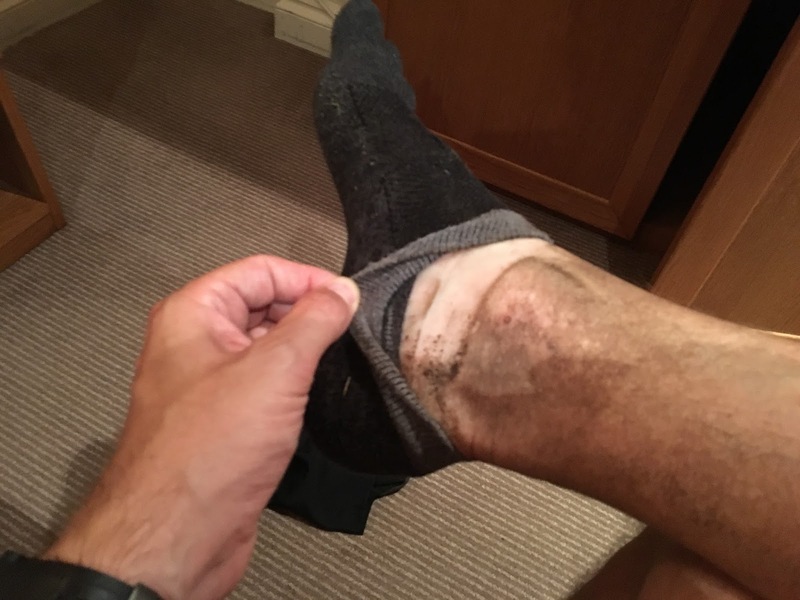 I wore full length tights for the Chiltern Challenge Ultra recently, and needed them, but I think short socks and shorts would be fine for this. I only picked up a few nettle stings and didn't get caught by any bramble bushes. If it's a nice day, dress light, and keep cool. I must try running with the Salomon pack and a vest one day to see if that's possible. I've always run in a t-shirt with the pack on, but I much prefer running in a vest. 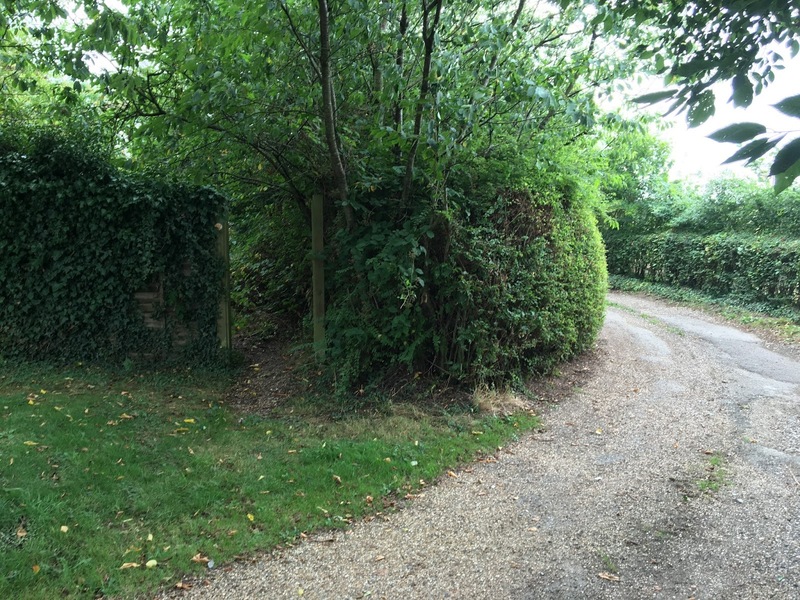 Near Crowsley - can you see the entrance? One thing to be aware of is that there are a few surprises where if you're not paying attention you'll run straight past the turnings. 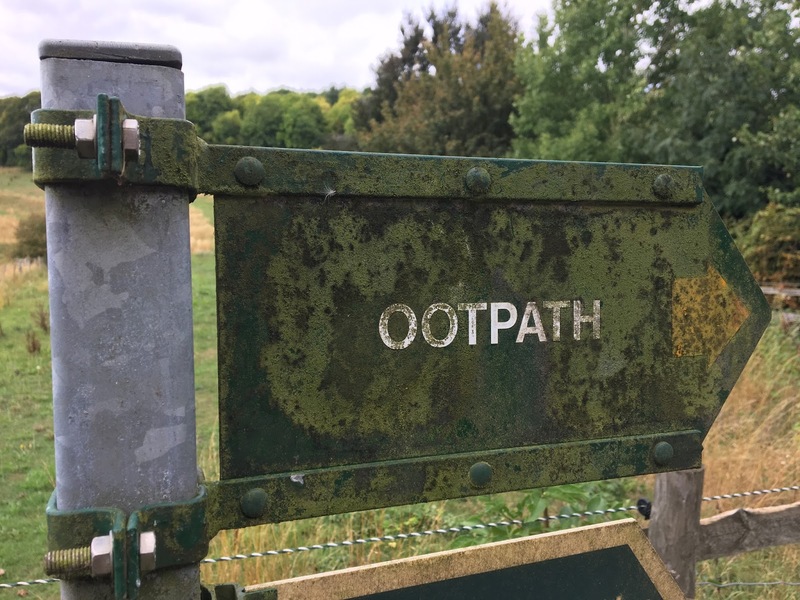 Some of the footpath and trail signs are completely obscured, and if I hadn't had a map to follow I wouldn't even have realised there was a turning there, never mind that I was supposed to take it! Although I haven't run a Centurion event before, I've been to a few in support of Mrs and their signage is really very good - however, sometimes locals or n'er-do-wells decide to remove or move the markers for japes or in protest, so if you can download the course onto something and keep half an eye on it then it may well save you a detour or two. Hard to see here, but this coiled wire has a sign on - "Attention! Electric Fence!" The only part of the course I found impassable across the whole two days was here, at Bix. 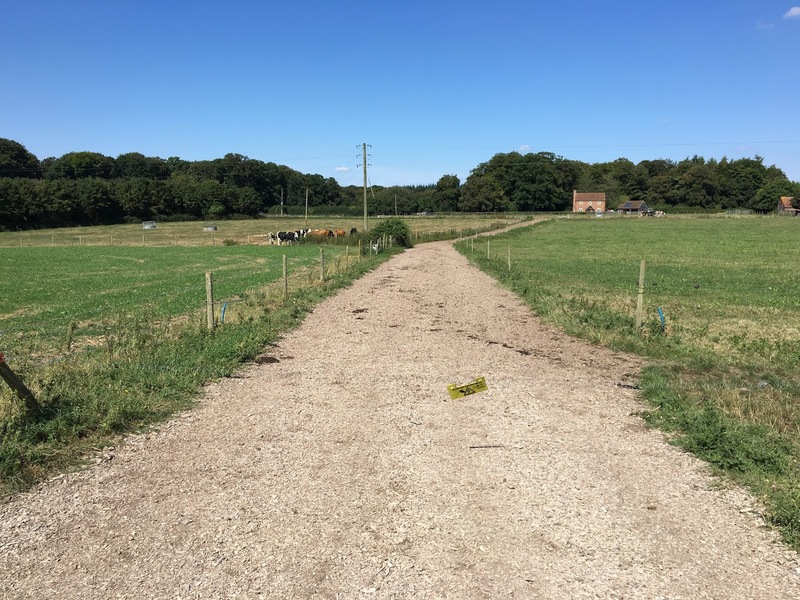 There was clearly no going through - I don't mind stepping over a fence from time to time, but when faced with an electric fence stretched across the path I'm going to take heed. 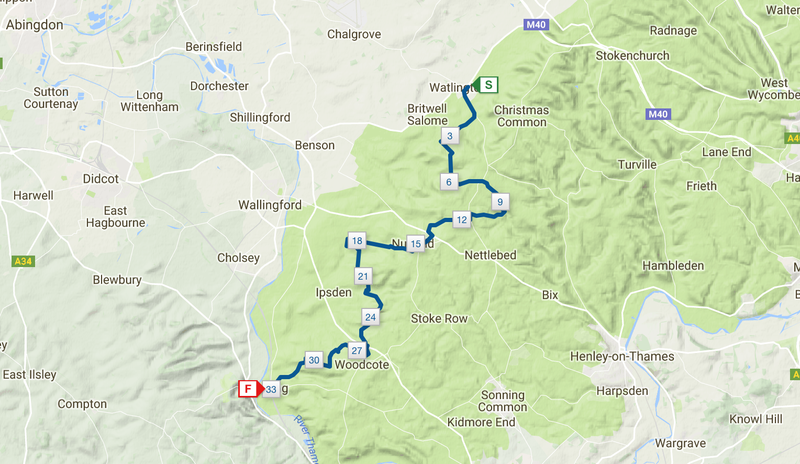 The race instructions do say to make sure that you've got the latest version of the route downloaded, and I did manually trace it onto the OS Map Finder app, so it may well be my mistake that routed me this way - but again another good reason to have a map. Beyond Bix, and at about 4:15 into the day I decided to stop for some food. I hadn't planned a stop (I should have done) so couldn't rely on running past a pub. 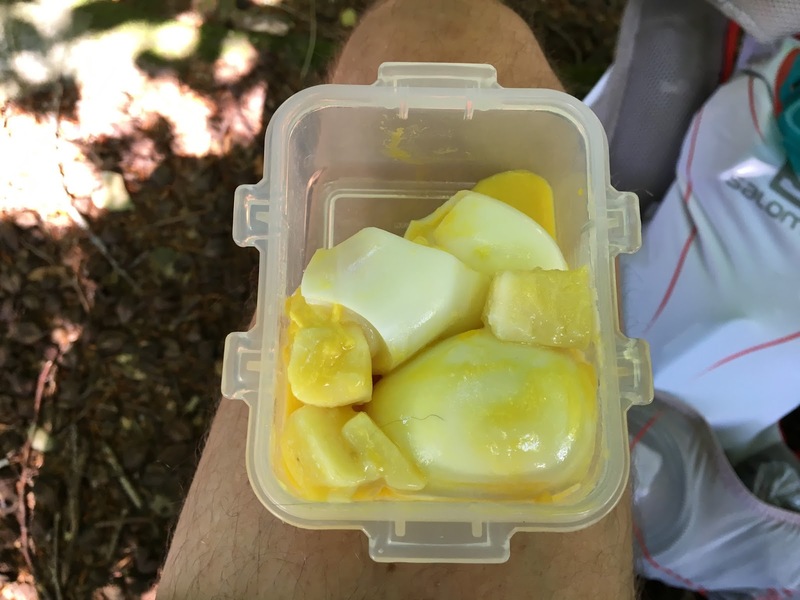 Instead I had a small airtight container with a couple of boiled eggs and some cheese cubes in. Today I learned that if you cook and shake them in your bag for four hours, they turn into mush. The eggs fell apart and the cheese melted. It was a bit of a mess, but I ate it anyway - tasted much better than it looked. Also had half a pork pie, reduced to 34p in Sainsbury's the day before - who can resist that?! (though it also hadn't survived the cooking/agitating cycle too well). 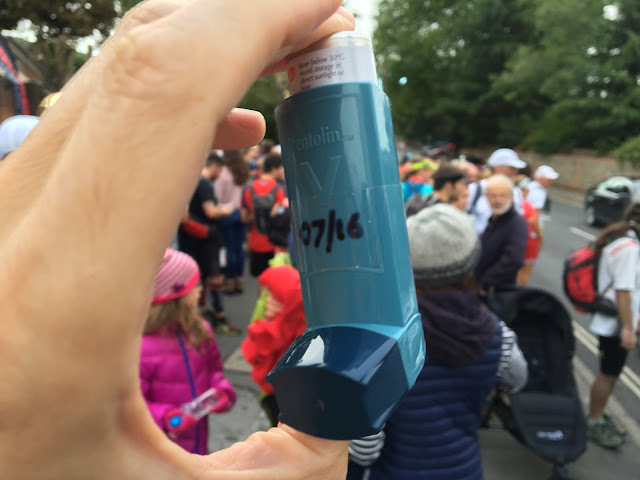 Again, not an issue on race day as there will be well-stocked aid stations. I was starting to get a bit concerned about water now - it looked like there was a pub a little way further on, but I couldn't rely on it being open. 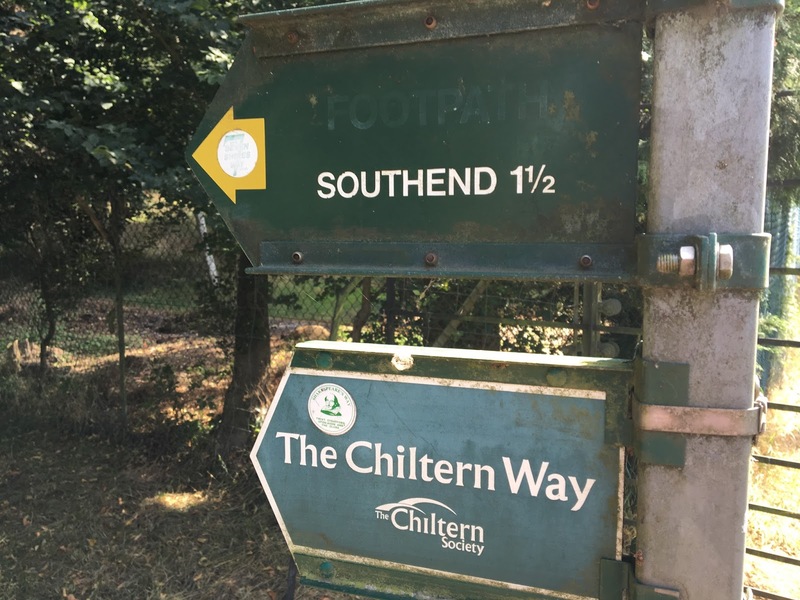 Who knew the Chilterns stretched all the way to South East Essex? One of the nice things about the route is the variation - through trails, forest, pathway, and more. 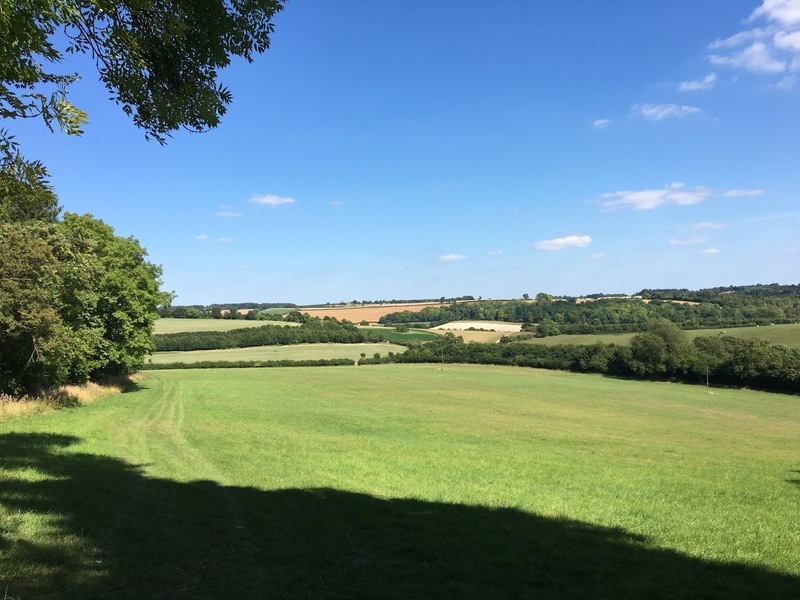 I find the "running round the edges of fields" courses quite uninspiring - this one has plenty to look at, and the frequent shade is helpful on a warm day. Sure, there's the odd field, but not too much of it. Not fully mobile? Tough. 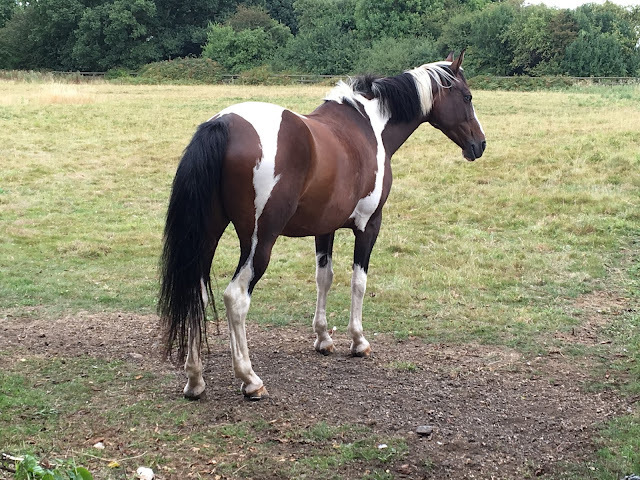 No countryside for you. I've ranted about this before when I ran the Capital Ring earlier in the year so I won't repeat myself - but I do wonder how many people are obstructed by contractions like the above. 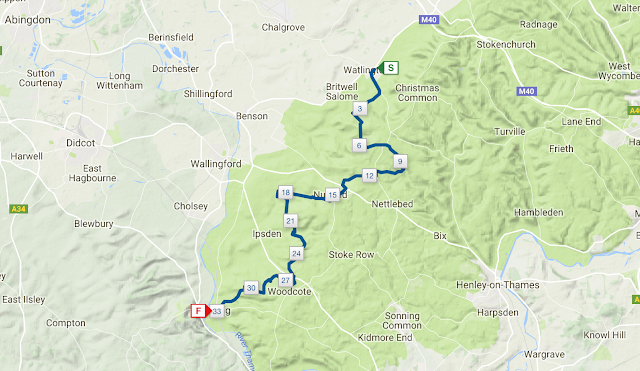 Coming up to five hours in, and the route had been relatively flat so far. One or two longer steeper parts were starting to arrive now, and I had been told that the middle of the course was hilliest. Another reason not to set off too fast. Really needed a drink and to refill my bottles now - I was suffering from not being able to keep my mouth wet with saliva - water please! I could see the pub as I ran down into Turville - it looked like it was open! I felt a bit bad popping in for two pints of soda water and to get my bottles refilled (i.e. not spending a single penny) - but thanks for being open, Bull and Butcher. The route doesn't quite go past the pub, but it's nearby. Maybe a nice place for supporters to grab some lunch on the day. Five and a half hours in, and this was by far the steepest hill yet. I'd applaud anyone who can run up it, I could barely walk up it in a straight line! Note that the path sends you into a load of underbrush alongside a fence about 3/4 of the way up - stay on the hillside outside all of that and the paths join - it's only about 10-20m long but will save scratched shoulders and legs and a lot of crouching over. It was definitely hillier through this segment. I was suffering a little due to not having drunk enough earlier, so my pace slowed a little though spirits remained high. 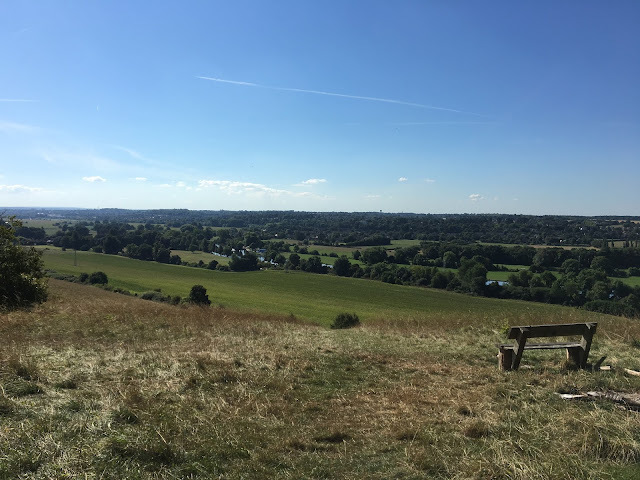 I have to say I was expecting steeper and more frequent hills - this is nothing like the hills on the North Downs Way around Box Hill (my current benchmark for "hilly"). 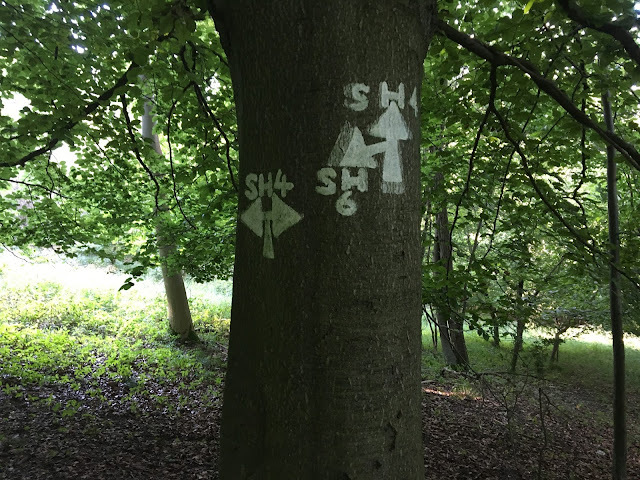 One thing to be aware of is that there are a lot of route markings sprayed onto trees and posts, and some on the ground. Some seem to point the way of the main routes, others are just white arrows with no legend. Don't tune in to following them, follow the official race route markers only (probably red and white tape, but pay attention to the race briefing on the day). 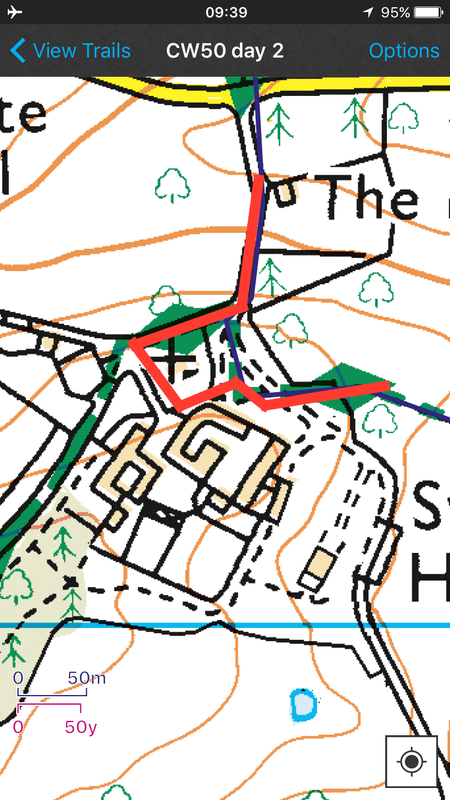 This was certainly the hillier segment, with a bigger hill coming out of Ibstone, and then another longer hill up to Christmas Common which I think is the highest point on the course. Getting tired now I was pleased to come down a longer descent in to Watlington. I deliberately scheduled a longer day and a shorter day - though I hadn't banked on today's 53.2km (33 miles) taking 8 hours! I had suffered through poor water and food planning, but this just meant a fair bit of walking in the last 20% of the day. 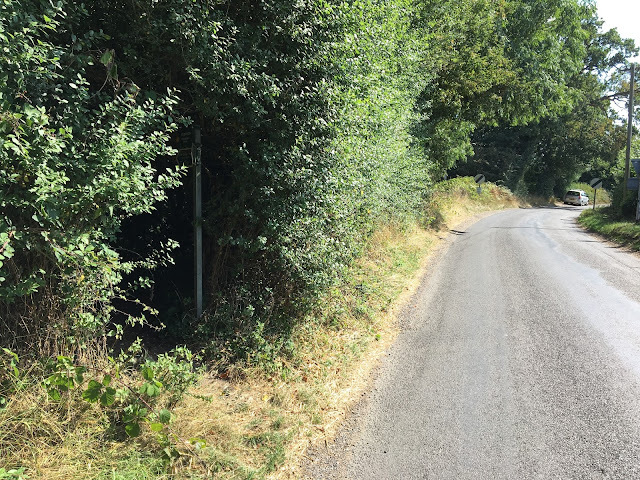 The road up into Watlington was busy with no pavement though only a few hundred metres of this is on the route - I had an additional mile or two to get to my accommodation but thankfully still had enough in the tank to jog up the road, with most drivers giving me a wide berth. 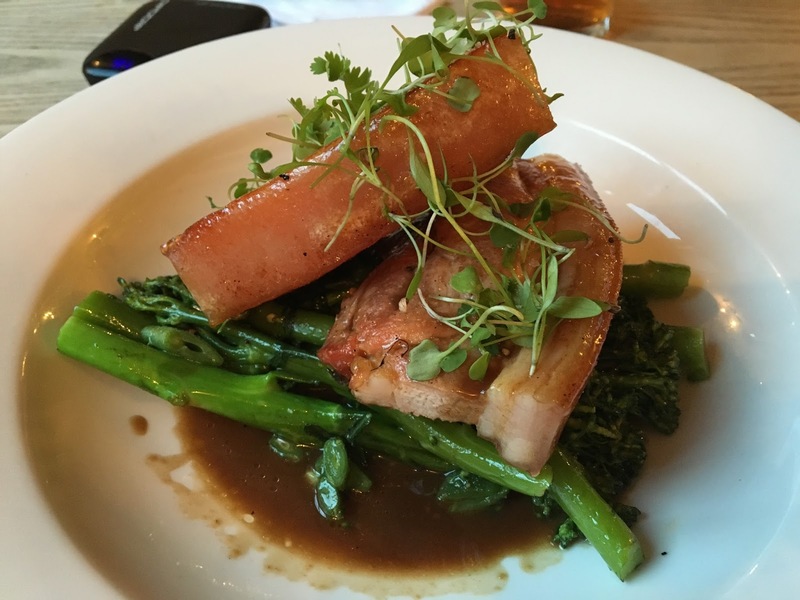 The food at The Fat Fox Inn was a real surprise - it was of an excellent quality, and the service was really good too. I'm very happy that I'll be staying here the night before race day! I was a bit achy in the morning, but soon ran it off and settled in to day two. After running back down the road with no pavement, I was off onto the trail again. 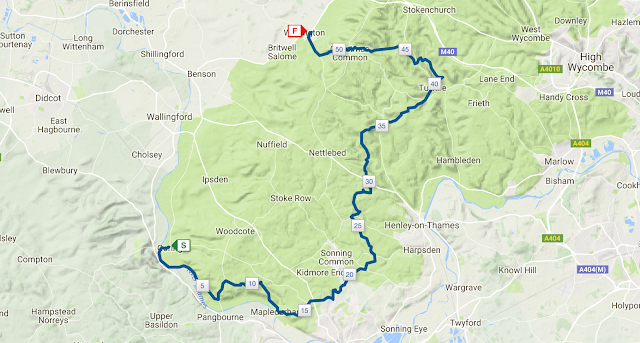 A shorter day today, with the final 20 miles (ish) of the course to cover. This section proved quite runnable, it appeared the majority of the challenging hills were in the final quarter of yesterday's route. It certainly wasn't flat, but the trail was good for running. The ups and downs kept it interesting. 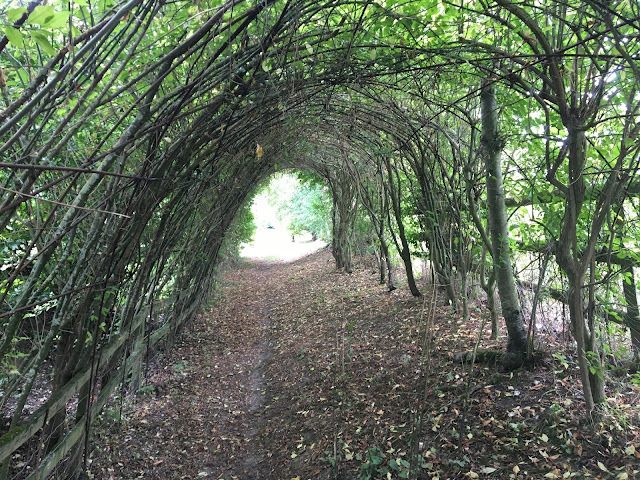 Perfect trail for running faster - if you've got any legs left after 35 miles! This is one part of the course I'll be looking forward to - there are several segments at this end of the course that are long woodland trail downhills - I hope I have the legs left to really open up a bit and enjoy it. Mrs tells me that one technique to counter fatigue is to actually run faster! Apparently it's all about just changing your stride and gait so faster is just as good as getting slower and slower (and, of course, is faster!). Now, the part shown above is the only place where I found myself completely stumped on where to go. 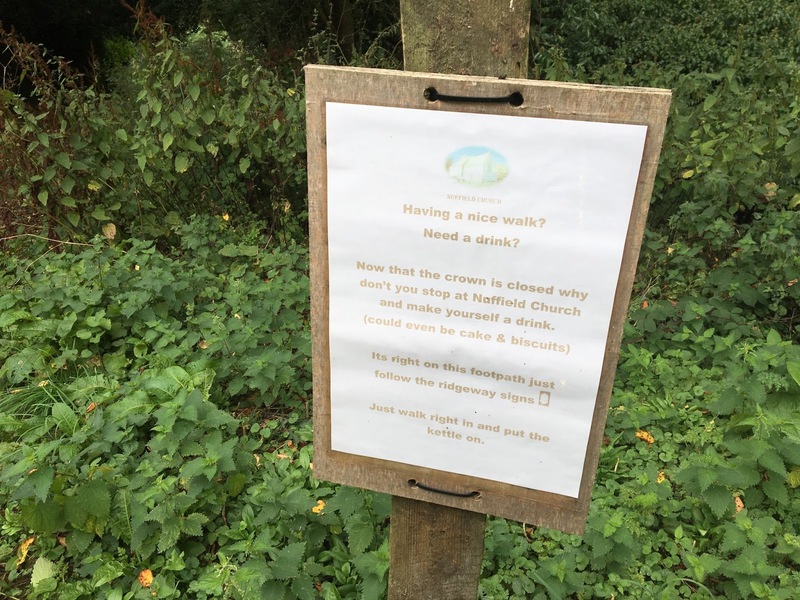 It's a church and some private land at Swyncombe. 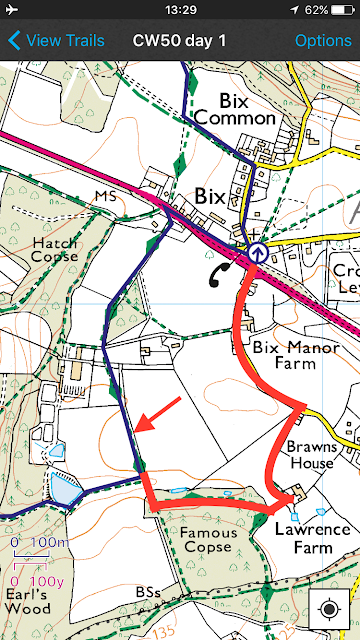 The route I'd plotted, which was following the dotted line, simply didn't seem to exist. After some wandering around and looking a bit lost, I figured it out. What you need to do is come down towards the church, turn left into the church yard (which is signposted, but disagrees with my OS map), through the yard and out of the gate at the back (which looks like it just goes into someone's garden), then left and the path crosses a private road and goes diagonally across a field. Back on track. The great views continued today as I was blessed with a beautiful sunny morning - perfect for running and taking in the views. For the most part, today's path was entirely runnable, but this was where most of the hidden entrances are. Keep your wits, and map, about you - particularly if you're getting tired in the closing stages. 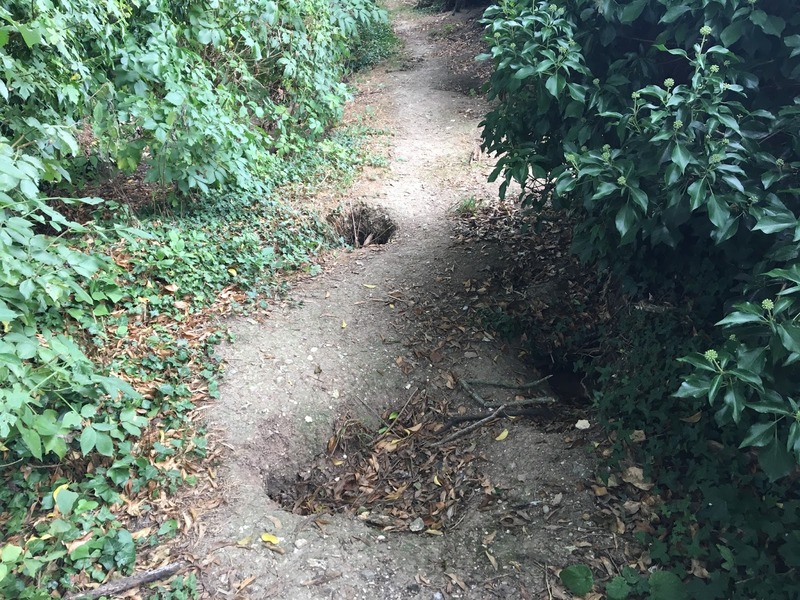 Whilst the surfaces are generally good, don't get too complacent - keep an eye out for holes in the path particularly in dusk or when tired, and also for submerged rocks and big stones - some can be pointy. Although today was shorter, I was clearly carrying some of yesterday's run in my legs - hardly surprising given it's the second longest run I've ever done. I was doing a fair amount of walking - but so what, the objective of this two days was to see the course not push myself too hard. There are some ups in the closing stages so it's not all plain sailing, however there are those lovely long gentle woodland descents to enjoy. Heading into the final stages now and it was clear that the majority of the tough hills are in the middle. It's by no means flat in the final half, and the hills will feel tougher without breaking for a night of sleep after 30 miles, but certainly the hard work in climbing is over. Key on race day will be to preserve effort for that middle section, and then leave something in the tank to run through to the end. "Walking it in" with 20 miles to go would be soul-destroying (as well as taking hours and hours). Plenty of wildlife on the course. 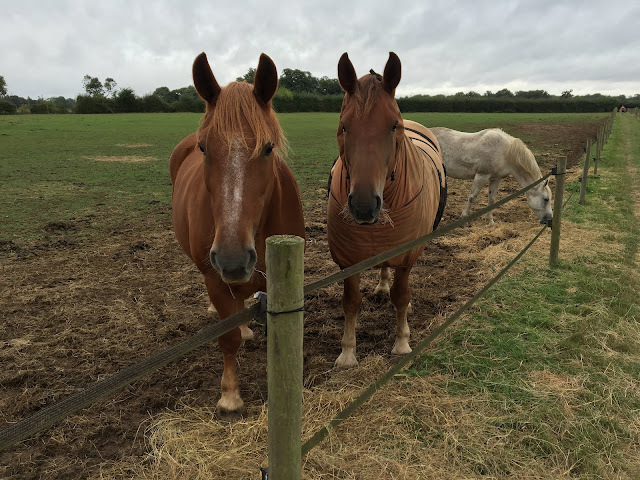 I often say hello to the animals, I wonder if they notice? I wonder if any of my fellow competitors will notice? I'll probably talk to anything after having gone this far. The last few miles take you back into Goring and down some paths that go behind rows of gardens. A little bit annoying as it's quite narrow and a bit brambly. Still nothing too tight, but I can see it being annoying after 50 miles. Day two finished back at Goring-and-Streately station, and just in time to get a ticket and get back home. By some coincidence, the audiobook I was listening to (Ender's Shadow by Orson Scott Card) which I'd started as I left the house yesterday morning, finished just as I got to the station. Couldn't have timed it better. So overall, 86.2km (53.6 miles) with 1,591m (5,220 feet) of ascent in 13 hours and 21 minutes. 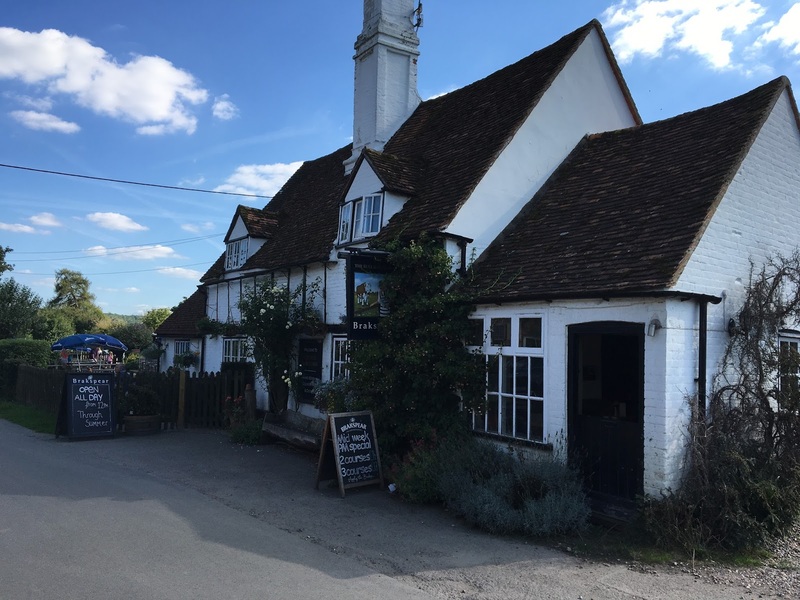 On the day this would be just outside the 13 hour cut-off, however I ran about 4km further than I will on race day to get to the Fat Fox Inn, plus I was quite nonchalant about the volume of walking and walked far more than I would do in a race. I'm feeling good about the race now I have a view of the course. It's a big challenge - 15 miles further than I've ever gone in a day before - but I'm confident that I'll get to the end. I have no objective on race day other than that - get to the end within the cut off. To start working out pacing and timings and set a target is completely inappropriate for my first attempt at the distance. Let's put that to one side and just get to the end!